I haven't mentioned the farmhouse series in awhile. Actually, I haven't mentioned anything in awhile. Sorry about that. Now that the days are shorter and I am being driven indoors earlier I suspect I will pick up the pace a bit with my blogging. But, back to the farmhouse.....I have been continuing this mini series, fitting them in when time is short or when there has been a particularly lovely day to record. The painting above was an August painting and was a morning rather than afternoon painting which is what most of the series depicts. I decided in the beginning that the only common denominator was to be the view and the size. I didn't commit to a specific time of day. The reason most of them are afternoon paintings is that I found the skies more interesting during that time of day. This summer enormous clouds would come rolling in around 11:00 AM and the show would continue throughout the day. Towards the end of August we had some beautiful soft mornings and although the clouds were missing I wanted to record the colors in the sky. 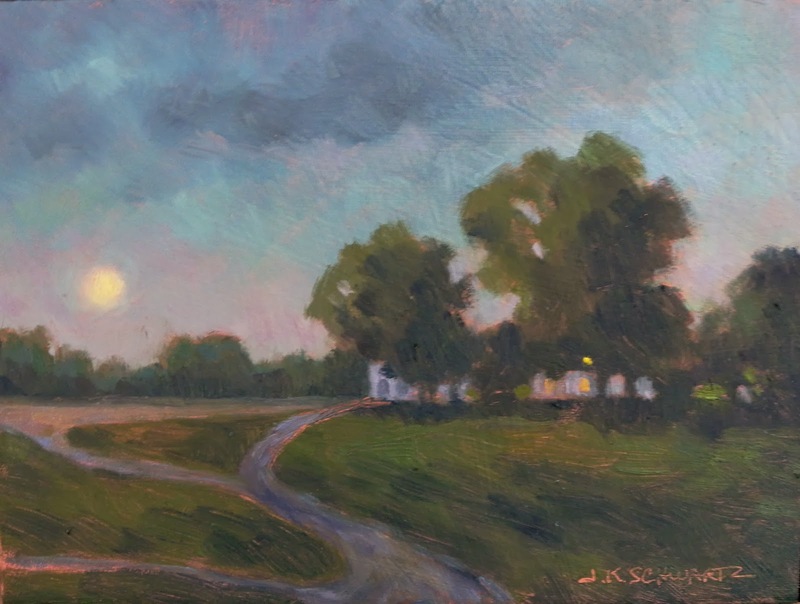 The painting below was painted in September and just as I wanted to have at least one morning painting I wanted to have a nocturne. What could be better than a full moon in September. Well, maybe a full moon in October. I did do another one that I will phtograph tomorrow (thought I had already done so) and it shows the farmhouse from a different angle. I did it for one of the small works shows I will be participating in and will not include it in the mini series. I would like to explore the nocturne further and attempt some larger paintings. I have always loved them and the mystery they suggest. I am being lax about updating my website so you might want to check that in a week or so as I upload more new work. I am getting back to my cityscapes and would like to do some more "in progress" posts as I get back to larger work in the studio. I am getting addicted. Small works are instant gratification. They are fun! Today I painted two (not shown here) and I am looking forward to doing more. I am wondering if I should be concerned that I am not interested in working larger at the moment. Perhaps it is because I feel the season slipping by and the leaves will soon be off the trees and I am not quite ready for that. The silver lining here is tht I will have plenty to choose from for the November small works shows I am participating in. The painting above is a little different for me which is part of the fun. It is titled "The Road Home" and is 8x10 inches as are the other works I am uploading here tonight. As I see this image here the colors look a little different how they appeared to me earlier but then my eyes are a little strained right now. I didn't think I needed to adjust this one on Photo Shop but I may be wrong. Huh! The colors in this one look different too. Maybe I'm losing my eyesight. I guess I am just more tired than I thought. 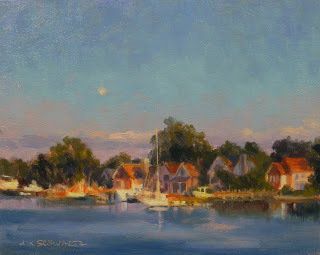 In any case...this one is titled "Evening on the West River" and is from an evening spent in Galesville MD at the end of August. What a soft, beautiful evening that was! I am thinking of sending these two to the Salmagundi in November but I haven't yet decided on the third. 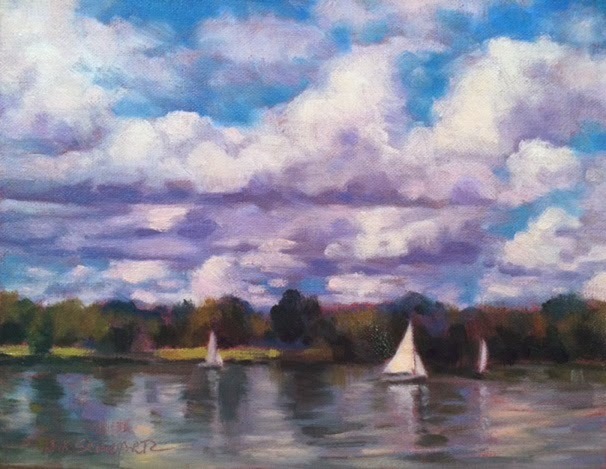 Perhaps the sailboat painting off Daingerfield Island that I showed you in my last post. I am uploading a better photo of that painting here. I didn't take the time to remove the pinkish color cast in the last photo. I am happy to say that for the third year in a row I have had a painting included in this annual exhibit, the American Artist Professional League's Grand National. This year marks the 85th year of this show. You can view the show online from Saturday, October 5th through Monday, October 30th just go to the following linkwww.americanartistsprofessionalleague.org. If it doesn't work then leave the s off artists but I am pretty sure I have it right. Use the menu bar at the top of the opening page to view the award winners and all the accepted work which is listed alphabetically. I think this year's show is a strong one, the figurative work in particular. Some of the images are not easy ones to view but they are powerful! I think it is time I join this organization as I appreciate the range of work they select. 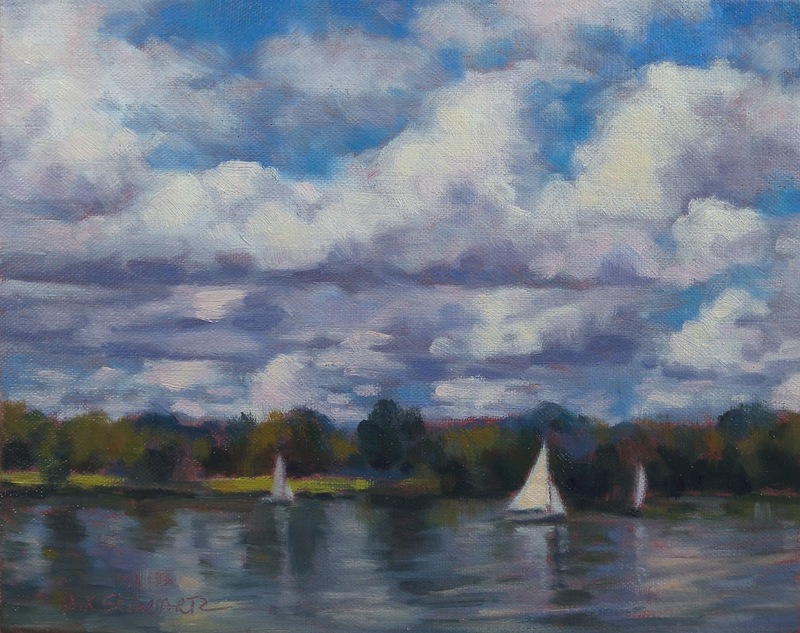 My painting was inspired by a predawn excursion on the coaches launch for the annual fall crew regatta at Cornell University. 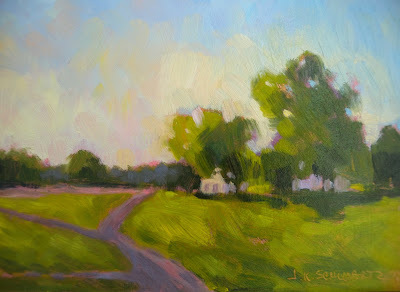 The light was really striking and that day yielded three paintings when I returned home. We were just there for the same regatta last weekend and once again we were on the inlet to Lake Cayuga before dawn. However, this year we had unseasonably warm weather and were socked in by dense fog. The fall colors were near peak but on this morning they were glazed with the gray of the low hanging clouds. Mysterious and beautiful as well. What I am currently working on are lots of small 6x8 and 8x10 inch paintings for the upcoming small works shows I will be participating in next month. I love doing these! One of the reasons is I find I loosen up and experiment more. I should take a lesson from this and do the same with my larger works as I can always gesso over the failures. I am not going to use my farmhouse series paintings for these shows as I want to exhibit the group as a whole before I start selling them off. 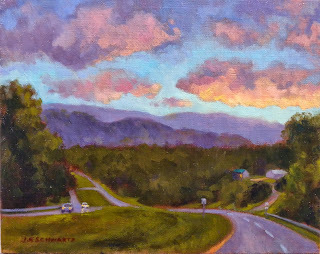 I haven't made a final decision as to which paintings are going to which show but I think the one below will be one of my submissions to the Salmagundi Thumb Box Show. The painting is 8x10 inches and is of a sailing class taking place off Daingerfield Island where the Washington Sailing Marina is located. The boats are called Solings. As you can see the sky was amazing that afternoon. 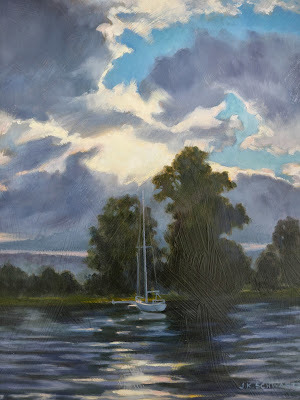 I had painted another painting earlier that morning before the sky put on this show and since nothing much was happening off the point I painted the boats moored at the marina. I didn't have time to stay and paint this one on site but I created it as soon as I could after returning home and used my photos as reference. 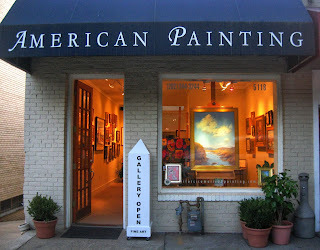 The painting shown here is currently on exhibit in the front window of the American Painting Gallery at 5118 MacArthur Blvd., NW Washington DC. This is in a lovely part of DC known as the Palisades which overlook the Potomac. 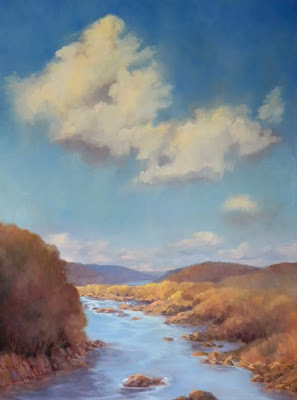 I live on the other side of the river in McLean and the Chain Bridge is the bridge I cross when on my way to the gallery or to Georgetown. I have always loved the bridge and the view from it. It is hard to believe that this view is just minutes from such a major city as Washington DC. It has not changed in all the years I have lived here nor will it change in the future. Thank God for parkland! If you visit my website www.jeanschwartzpaintings.com and go to the landscape page you can see versions of this view and a painting of the bridge from down along the river. Here is a view of the painting in the window which I think is a terrific window in which to showcase a painting! 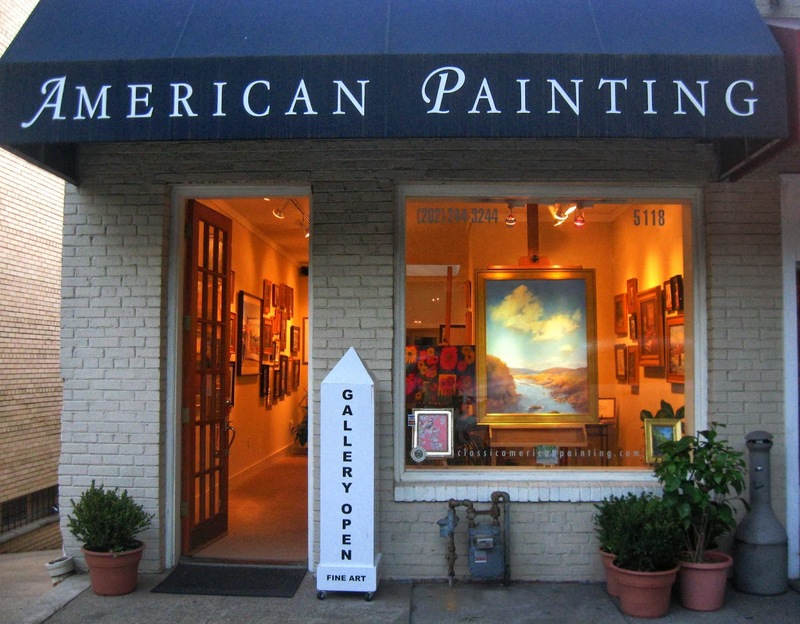 I am delighted to be represented by this gallery and look forward to seeing more of my work on the walls here. The next show I will participate in will be the "Small Wonders" exhibit which will feature the work of the Washington Society of Landscape Painters. That will be opening on November 23rd and I will post more information about it as the time grows closer. 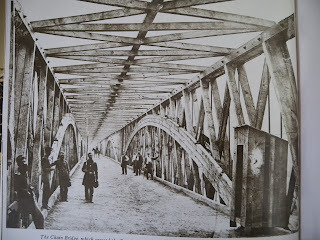 I thought fellow history buffs might enjoy seeing what the Chain Bridge looked like during the Civil War. 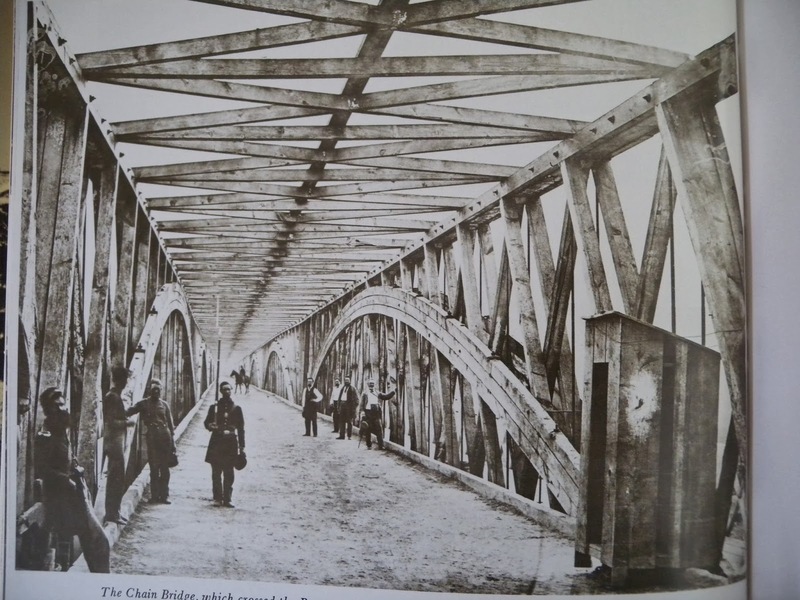 Today it is much more graceful in appearance and all that overhead wooden structure disappeared long ago. For those of you not familiar with this area the Chain Bridge is located just below Fort Marcy which was constructed during that war for the protection of Washington DC. As you can see it was heavily guarded by Union troops. Fort Marcy was ringed by a series of deep ridge works which added to the security of the fort and all the trees were cut down and lookout towers were erected. My house is built at the top of one of those ridges. Today the fort is heavily wooded but the old cannon are still there as a reminder.